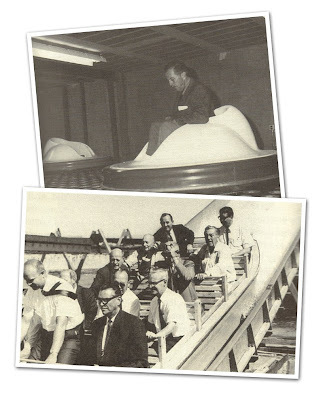 Roller Coasters, Flumes, and Flying Saucers by Robert R. Reynolds is a look at the history of ride design company Arrow Development, as told through interviews by its founders Ed Morgan and Karl Bacon. The book is full of stories about rides for Disney parks, ventures with other parks, and interesting anecdotes about the general history of rides and roller coasters. 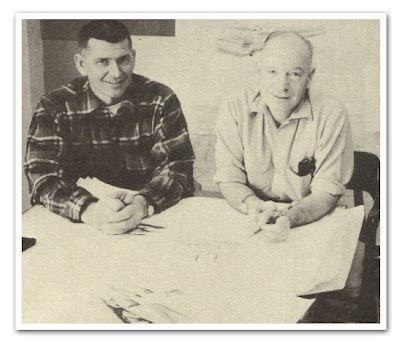 Ed and Karl met in a civilian Navy plant during World War II. Soon after they founded Arrow Development and began work machining parts for everything from crop dusters to Hewlett Packard machinery. Before they knew it, they were in the amusement park business. The first in a long line of revolutionary developments, the team built the first all-steel carousel. It wasn't long after that a small boat, the Lil' Belle, that caught the eye of Disney. The boat was built for Lake Merritt Park in Oakland, California. Soon, Arrow Development was contracted to build ride systems for the soon-to-open Disneyland park. The team conceived and built the dark ride systems that we know today. The list of their early contributions include Mad Tea Party, Snow White's Adventure, Mr. Toad's Wild Ride, Casey Jr. Circus Train, Dumbo, Autopia, and Alice in Wonderland. A later challenge was the Matterhorn. Here Arrow had other firsts in the amusement park business, including one that would revolutionize the roller coaster industry: tubular steel track. Through the course of time, Arrow Development designed rides for Disneyland, the 1964/1965 New York World's Fair, and Walt Disney World. Their Disney credits go on to include It's a Small World, Flying Saucers, Pirates of the Caribbean, and development of the Omnimover. They worked with other theme parks, many of which failed, including Freedomland in New York, the Pacific Ocean Park in California, Knott's Berry Farm, and Busch Gardens. They had further revolutionary designs in the amusement park realm including the flume ride and the corkscrew loop. Along the way, they also had other projects such as designing capsules that would sustain monkeys sent into space. The book is filled with stories about Arrow's interaction with Disney through the years: their transition to working for "movie people" instead of amusement park operators, Disney briefly owning an interest in the company, Karl getting sucked into the air system of the Flying Saucers, flooding out the Small World show pavilion at the World's Fair, and interacting with numerous Imagineers as they did what they did best. In 1998, Ed Morgan and Karl Bacon were honored with the Hall of Fame Living Legends award by the International Association of Amusement Parks and Attractions. They are the first to share the award, and the honor puts them in league with the likes of George Ferris, Walter Knott, and Walt Disney. The Verdict: This book is a quick easy read, laid out almost entirely as interview answers by Ed and Karl. At times they often speak highly technically, which could cause the average reader (myself included) to not understand all of their jargon. But in the midst of this, is a long trail of great stories told by the men themselves -- stories about their hardships and successes, and stories about the people they worked with. It focuses mostly on their work with Disney, but does include many of their greatest achievements apart from their ties with Disney. This is not a book for everyone's shelf, but it is a must have for the collector or researcher of any theme or amusement park. EDIT - FEBRUARY 19, 2012: I have been informed by the author that this book is now available in Kindle format through Amazon. Aftermarket prices for the print version have remained high for years. So this is a great opportunity for anyone who was looking for a good read rather than investing in a collectible item for their shelf. Gosh, I read this one a long time ago. I remember it being the first place I ever heard of the Flying Saucers at Disneyland.